Low Profile Hopper Forklift Attachment On Sale Now - Made In USA! 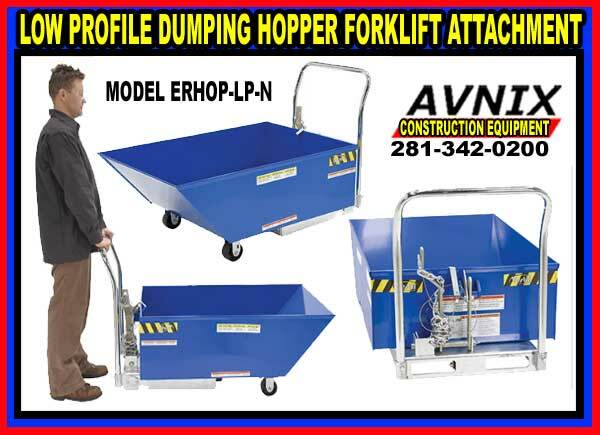 Avnix low profile hoppers are intended to function as a dumping hopper that can be dumped with the help of a forklift truck. Our low profile construction allows the forklift hopper to be positioned below machines to be used as a catch bin for parts and other equipment. Our recently designed low profile hoppers reduce the danger, inconveniences and time when collecting parts and other tools off the floor. Our 1⁄2 cubic yard, 10 gauge, steel low profile hopper has fork pockets for dumping the hopper 90° with aid of a forklift. 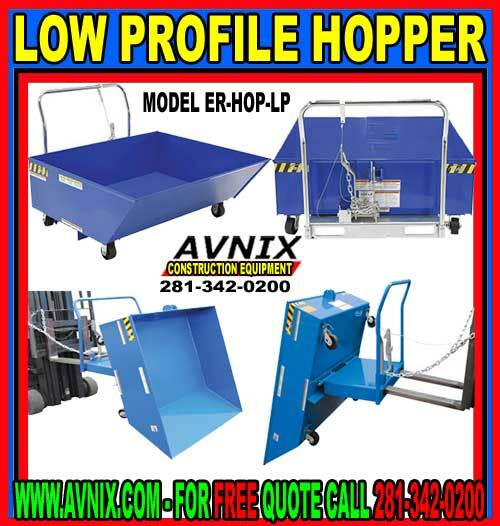 MODEL ER-HOP-LP-N on (3) wheels (2) rigid and (1) swivel with brake that includes a detachable push handle. After the load is dumped, the hopper will go back to the locked position when lowered to the floor. Blue baked-in powder coated finish for better protection. When transporting any materials around a storehouse or industrial plant, safety is essential. The more dependable the forklift dump hopper is, the better, and the better care that is taken, the less probable your employees are to have a expensive and careless accident. By using dumping steel hoppers and carrying products on a typical forklift truck, you get the best of both worlds – a forklift hopper attachment that is easily controllable in terms of loading and unloading, and one that is quick, dependable, and is able of moving large amounts of material in one trip around the warehouse. Low profile hoppers offer you the capability to move material around in one trip, and offers the easiest way of unloading when required. Our low profile hoppers have been designed around a simple gravity boosted hinge, which allows the contents of the forklift hopper to be discharged at the pull of a chain. Safe use recommendations: Avnix works hard to identify all hazards connected with the use of its products. Nevertheless, material handling is innately dangerous and no manual can tackle every risk. The most effect means for preventing injury is for the customer to apply good decision making when using this forklift hopper attachment. Material handling is dangerous. Improper or careless use may result in severe personal injuries. 4) Broken welds. Inspect the hopper before each use according to the inspection instructions on p. 7. DO NOT use the hopper unless it passes every part of the inspection. DO NOT use the hopper if the safety chain is damaged or absent. DO NOT lift the hopper until it is securely connected to the carriage of the fork truck with the safety chain. DO NOT fill the hopper with a load weighing more than its capacity (2,000 lb.). DO NOT stand beneath or travel under the hopper at any time. DO NOT permit any person to stand beneath or travel under the hopper. Hoppers with lifting lugs can be lifted with overhead hoists and cranes. DO NOT lift a hopper unless the chute is securely latched to the frame. The hopper must not be able to rotate while it is suspended. DO NOT allow people to ride on or in the hopper. DO NOT use the hopper if any product label is unreadable, damaged, or missing. Contact Avnix to order replacement labels. DO NOT modify the hopper in any way! Modification(s) might make the hopper unsafe to use and automatically void the limited warranty. DO NOT dump the hopper UNLESS every person in the vicinity is safely behind the forklift truck. ALWAYS engage the caster brake when the hopper is stationary or not in use. ALWAYS apply proper forklift truck procedure practices learned during your training program. Before raising the low profile hopper from the floor AND tilt the (forklift) mast toward the cab of the truck to make sure that the hopper will not slide towards the tips of the forks. Steel Pick Up Truck Loading Ramps For Sale Factory Direct Guarantees Lowest Price!